Oh, I love this quilt so much. 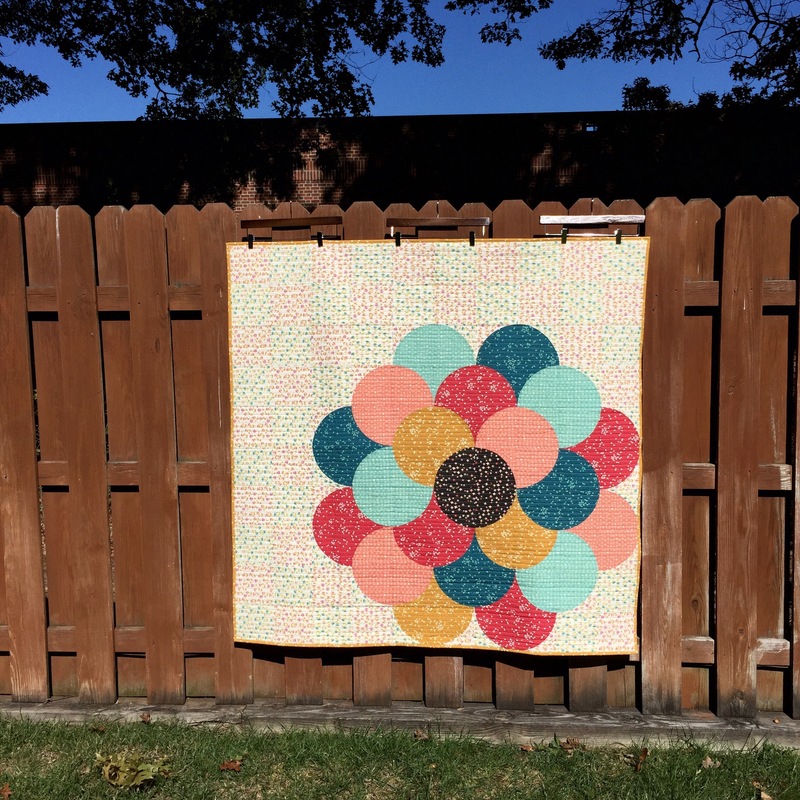 This is the Floret quilt, made for Quilt Market for Cloud 9 Fabrics‘s booth to display the Vignette Collection by Aneela Hoey. It’s my original design and will be available as a free PDF download pattern when the line starts shipping to fabric stores later this fall. I used Jen Carlton Bailly’s quarter-circle templates, and though a paper template will be available with the download, you can buy her plastic ones (they’re awesome, trust) in her online shop. I wanted to make something with big impact, and the line’s contrast between dainty floral prints and saturated small-scale quilter’s staples made that an easy task. The buttercup prints alternate in a traditional patchwork background. I like that it added interest to a spot that would be considered the design’s negative space. I know that Floret is a little bit of an ironic title– it does literally mean a little flower, and this one measures 45″ square. But florets are also the tiny flowers that make up the head of a daisy or a piece of broccoli as well as the name of the print in that position on the quilt. It’s the focal point, and a funny way to describe one big quilty flower. I also want to acknowledge that it’s an organic and imperfect layout on purpose. I tried one that was more methodical and geometric, and it just didn’t look right. If you’re heading to Houston, be sure to look for Floret in person. I’m looking forward to seeing it in photos there and also to the pattern release. I’m hoping to make it again… maybe in solids. Oh yeah. I do also want to mention that this was partially inspired by this quilt “Balancing Act” by Amanda Hohnstreiter from Quiltcon 2015. I have been thinking about how to accomplish a similar layered circle effect, and this is how that inspiration manifested itself. Another part of the inspiration is Lisa Congdon’s line drawing class on Creativebug, where she teaches how to draw a poppy. I’ve been thinking a lot about how important it is to acknowledge and credit design inspiration. But that’s a conversation for another day. this is absolutely adorable! I cant wait to get the pattern, I am definitely making this! Love the prints too, they look so delicate! it’s absolutely gorgeous! i’m excited for the pattern – i have jen’s rulers on hand and love any chance to use them. Love, love, love! Just absolutely love! The patchwork background is brilliant! I really love the subtle asymmetry and the color play in the background / negative space is a great treat for the eyes, too. Beautifully done!